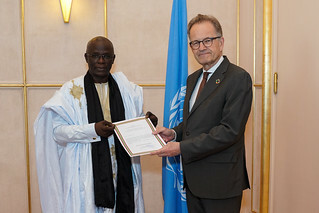 Mohamed El Habib Bal, the new Permanent Representative of Mauritania to the United Nations Office at Geneva, today presented his credentials to Michael Møller, Director-General of the United Nations Office at Geneva. Before his appointment to Geneva, Mr. Bal had served as Mauritania’s Ambassador to China since 2009, concurrently covering Viet Nam, Thailand, Lao People’s Democratic Republic, Myanmar, Cambodia and the Democratic People’s Republic of Korea. From 2007 to 2009, he held the post of Director of African Affairs in the Ministry of Foreign Affairs and Cooperation of Mauritania, while from 2004 to 2007, Mr. Bal served as an Advisor to the Mauritanian Presidency on human rights and legal affairs and as ad interim Director of the Cabinet of the President of Mauritania. During his career, he has represented Mauritania in many conferences and meetings of the United Nations, as well as other international and regional organizations. Before joining Mauritania’s foreign service, Mr. Bal worked as the Director of the Legal Department in the Mauritanian Bank for International Trade from 1999 to 2001, as well as a consultant to the World Bank, Ministry of Justice, and the African Union on a range of issues. He has been teaching law at universities in Mauritania, Senegal and France since 1996. Mr. Bal holds a PhD in law from Université Lille II, France and a Master’s degree in business law from the University of Dakar, Senegal. He was born in Kaedi, Mauritania, on 9 November 1959 and is married with one child.